The holly, or Ilex, genus consists of a large group of evergreen and deciduous trees that range in size from 18 inches to more than 50 feet tall. Valued for their attractive foliage and bright, decorative berries, holly trees add a dramatic touch to the garden, particularly during winter when other plants are dormant. Often used as accents, barriers and hedges in the home landscape, holly trees offer numerous varieties to suit most any garden. Popular varieties include American holly, Japanese holly and Chinese holly, but all types have similar care requirements. Plant your holly tree during early fall before the soil freezes. Choose a planting site that receives six to eight hours of full sunlight and has rich, well-drained soil for optimal berry and foliage production. Space holly trees 5 to 10 feet apart. Apply a 3-inch layer of mulch to the soil surrounding your holly tree to insulate the soil and suppress competitive weeds. Start the layer of mulch about 3 inches from the crown of the plant to provide air circulation and prevent fungal diseases. Water holly once per week throughout the year to provide plenty of moisture for growth. Apply water directly to the soil to reduce the risk of disease. Never allow standing water to accumulate or the tree's crown may rot. Feed your holly tree during fall, just before the first freeze of the season. Use a low-nitrogen 5-10-10 NPK fertilizer to maximize berry formation. Apply following the manufacturer's directions and water immediately after feeding. Prune holly trees once each year during fall, immediately after fertilizing for the best results. Use pruning shears to remove leggy, diseased or damaged growth, which will increase the aesthetic appeal and overall health of the trees. 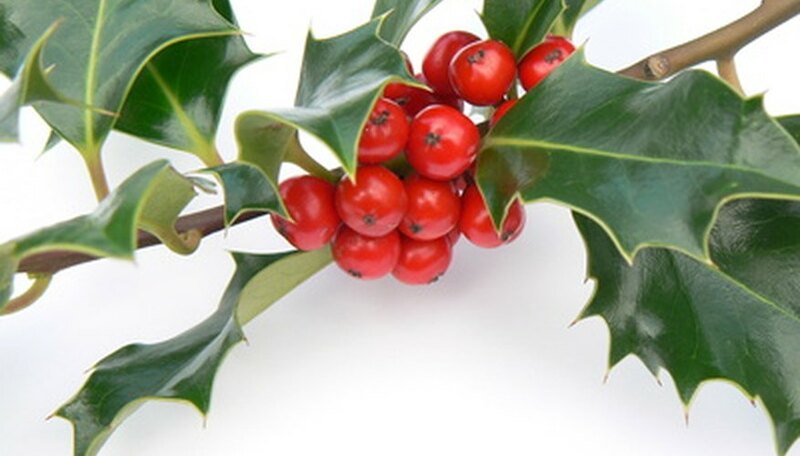 Most species of holly require a male and female plant to produce berries. At least one male plant is required for every five to 10 female plants. Holly trees prefer a thick mulch, such as wood chips or shredded bark. Wear gloves when handling holly, as the foliage is lined with sharp barbs.